If the only way you have to track status of marketing activities within your team is via emails and spreadsheets, then you are spending precious time on tasks that do not add value. What if you could assign tasks to your copywriter, the designer, your marketing coordinator and your outside contractor by simply clicking a button? Now you can. 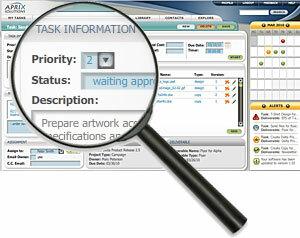 Once you create a task with Aprix Marketing Manager and assign someone to take care of it, that person will immediately see that same task on his or her “My Tasks” screen. Every time a team member logs on to the system, the first thing they see is their list of tasks. When a new task is assigned to them, that list is refreshed. No guessing what to do next or procrastinating… the list of tasks is right there on the screen. True Marketing Project Management at your fingertips. Tasks have deadlines, due dates, and priorities. Marketing managers can assign tasks and change priorities and due dates to ensure projects get done on time. Team members can focus on the highest priority and the earliest due date without having to exchange emails, phone calls or attend status meetings. Now that it is clear what tasks everyone have on their plate, the marketing team can spend more time actually working and less time trying to figure out what’s next.